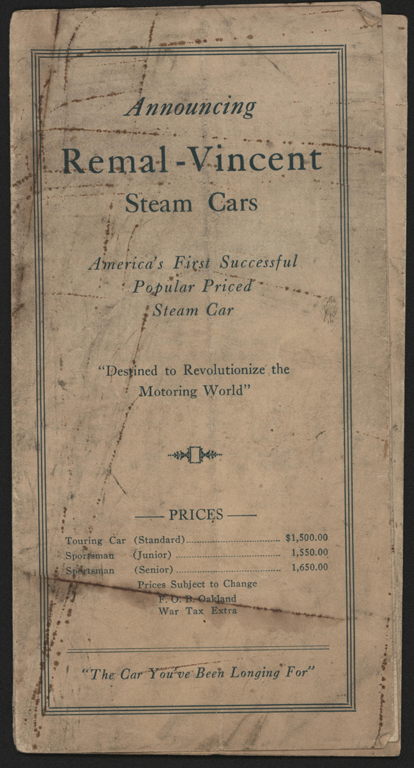 The Steam Car Corporation of California produced one demonstration steam car. Its whereabouts is unknown. It succeeded an effort by the Mathiesen Motors Company, which was the northern California agent for the Coats Steam Car, to produce steam cars on the west coast. The car was named the REMAL-VINCENT STEAM CAR. 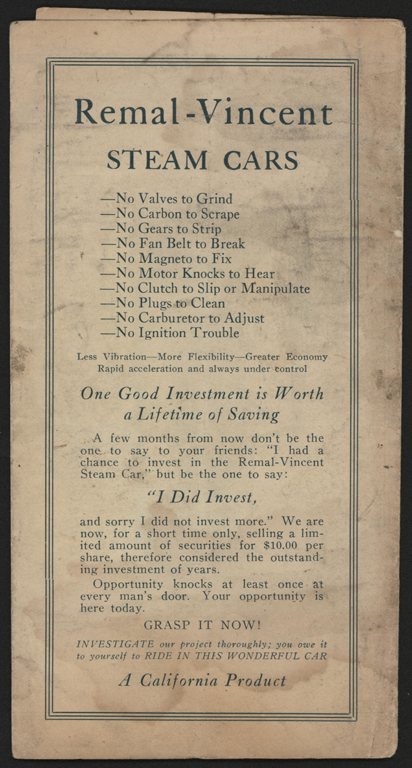 Ernest Vincent, who claimed to have studied steam cars for twent years, was given top billing, probably because he held patents for the Vincent Steam Generator that was used in the car.. Vincent claimed to have tested his new designs in an old Stanley. Such was his confidence in his work that he earlier formed the Steam Automotive Corporation on 3rd Street in Oakland. 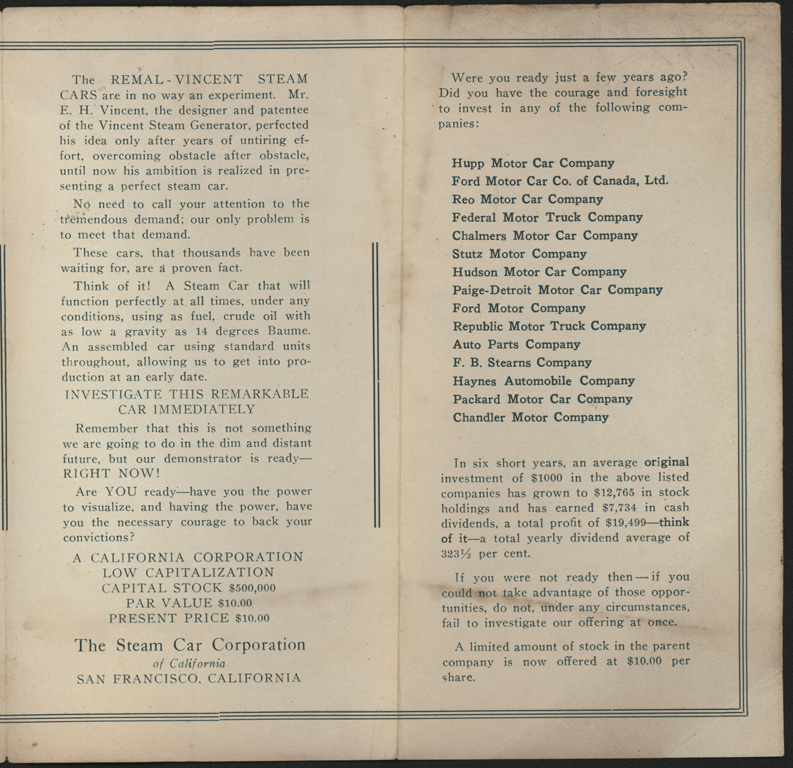 It was the merger of the Mathiesen and Vincent Companies that created the Steam Car Corporation of California, although Vincent's company remained independent. The company showed its first and only demonstration car in San Francisco on June 16, 1923. It featured a four-cylinder, vee style engine with a two-speed transmission. Vincent's tubular boiler had removable sections for easy repair and maintenance, perhaps along lines of the Bryan Steam Car design. Shortly after the demonstration, the parties squabbled and ended up in court. This spelled the end of the project for everyone. The Remel-Vincent Steam Car. 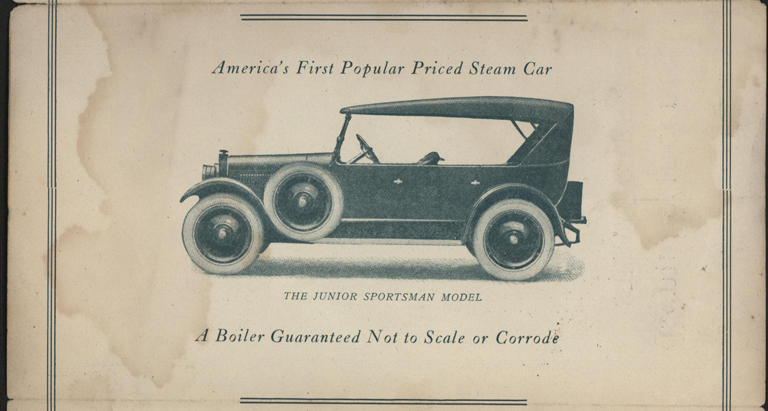 This is The Junior Sportsman Model and was probably the demonstration car. 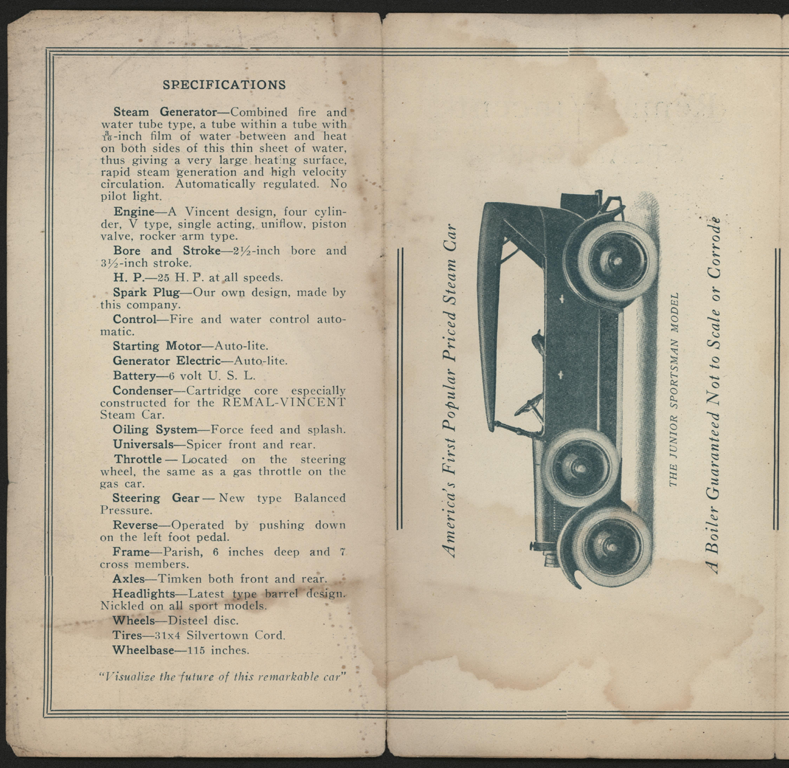 This brocure promotes the Remal-Vincent Steam Car. This account is drawn entirely from Kimes & Clark. Their article mentions local newspaper articles and court cases, so productive research remains to be done. Kimes, Beverly Rae and Clark, Henry Austin, Standard Catalogue of American Cars, 1805 - 1942,, (Iola, WI, Krause Publications, 3rd Edition, 1996), p. 1278. 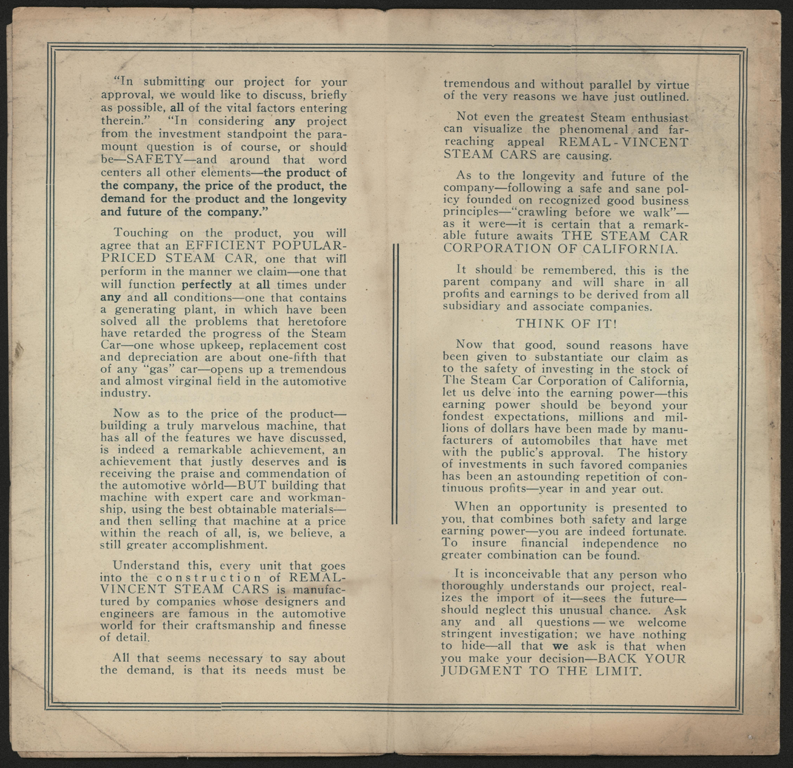 Contact us if you have additional information about the Steam Car Corporation of California , or if you have questions.